1. Prepare 4 bowls with mixed greens. 2. 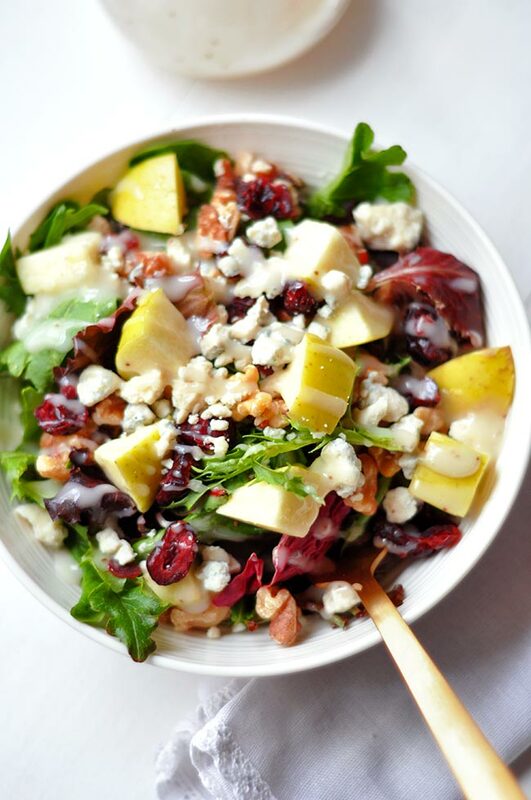 Top with apple, walnuts, cranberries, blue cheese then drizzle with Vidalia dressing. Can I interest you in a cranberry walnut blue cheese salad drizzled with sweet vidalia onion dressing and topped with chunks of granny smith apple? Have you made peace with blue cheese? Yes? Good! 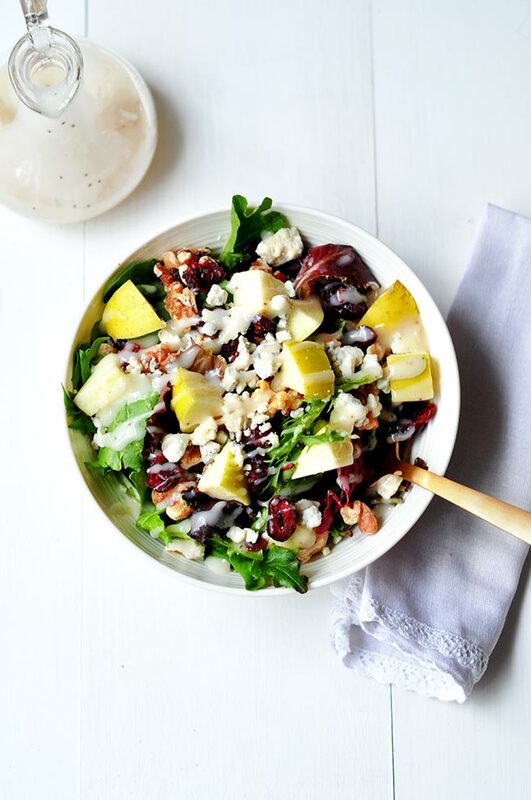 Then you can probably just skip right on down to the recipe part of this page because you’ll l-o-v-e the amazing, super-simple combination of sweet-tart-nutty-healthy flavors in this cranberry walnut blue cheese salad. Does the fact that it’s moldy weird you out? Me too. But it’s actually safe mold. Those of you still on the fence about this moldy cheese, hear me out. A few months ago, I was you. Does blue cheese even taste good? So it wasn’t the mold that bothered me. It wasn’t even the look or the smell of it that bothered me, it was the taste. I kept trying it and kept not liking it. See, the Mr. loves blue cheese and he’s always ordering those lettuce wedges topped with blue cheese and whatever else and every time, I ask for a bite. Every time, not happy I did. So one day, I’m shopping pre-packaged salads at the store and I stumble upon this salad with interesting ingredients—cranberries, apples, walnuts, and what I thought was goat cheese. I think my contacts were in the wrong eyes that day or maybe my kids were trying to climb out of the cart or maybe both (God knows I’m usually a hot mess by the time I get to the grocery store and I of course run into everyone I know that day). Whatever was happening that day though ended up being one of those happy accidents because you guessed it—that “goat cheese” was indeed blue cheese. The following day, after I discovered this little mishap, I decide to give blue cheese another chance. This is what I learned: blue cheese tastes amazing paired with something sweet. All the times I’d tried it, the blue cheese was mixed in with a bunch of other savory ingredients like bacon and sour cream. Some of my favorite ingredients in other recipes but together with blue cheese these favs were bad, bad, bad. Too much of a good thing, maybe? So, that was it. That day I discovered the magic of blue cheese happens when you introduce it’s rich creamy, tangy flavor to sweet, bright and earthy companions. That’s my story and that’s why you should give this salad a try even if you’re not a fan of blue cheese. 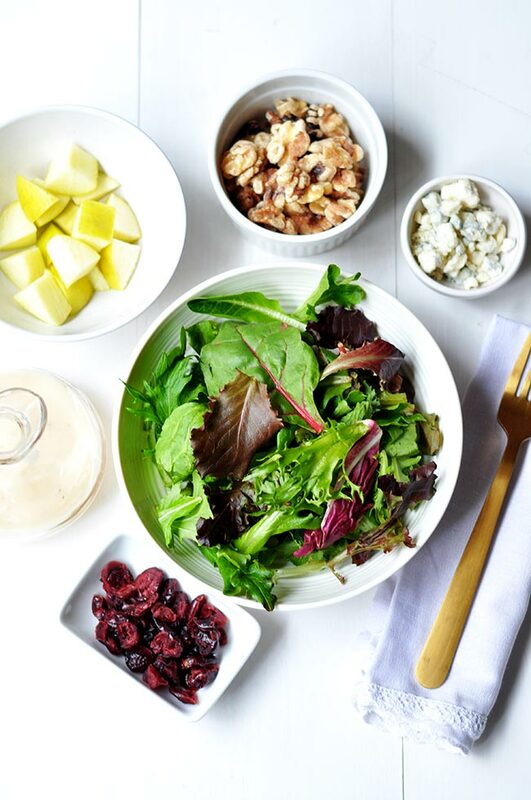 Are you searching for healthy work lunches? This is a good one! It’s only 6 ingredients and stores well with dressing. So it’s easy to pack in a single container and eat at work. Want some other lunch ideas? Browse all my lunch recipes. 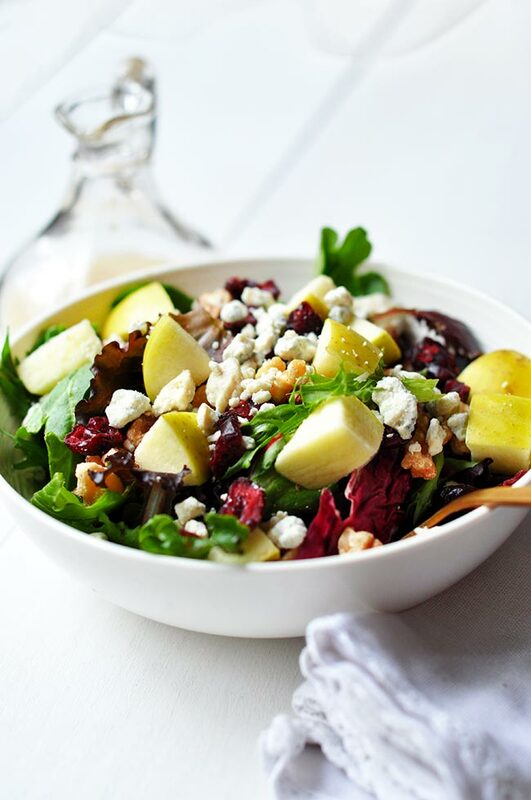 This recipe for Cranberry Walnut Blue Cheese Salad was featured on Sew it Craft it Cook It!